I started taking iphone photographs threes years ago. I fell in love with using Hipstamatic for street photography. Its shutter is quick and precise, the image full of layers and fine texture. It is especially good for the confrontational environment of our streets. I am often surprised with the outcome. Everyday I hunt like a predator on the street. I shoot, and I shoot in disguise, lurking at the corner, waiting for my photos. 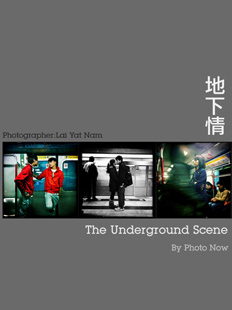 “The Underground Scene” is the first photography series of “Photo Now”. Underground in the MTR, I ride and capture the people and the scenes in the carriages, on the platforms, and waiting in the train station lobby. Here I have found my “Tokyo Story” old couple, the South Asians of “Chungking Express”, the Tin Shui Wai residents in “Day and Night in Tin Shui Wai” and the “Bounce Ko Gals” lovers in our MTR. By using the new technology, I hope through “The Underground Scene” exhibition, to highlight a new approach to photography. LAI Yat-nam was born in 1978. He enrolled in the Hong Kong Academy for Performing Arts (HKAPA) in 1997 for Diploma in Film and Television. Upon graduation, he continued studying in Bachelor of Fine Arts in Film and Television, majoring in Cinematography/Lighting Design and graduated with honor in 2002. His first photo exhibition “Tell Me How Not to Think About Her” was display at the Fringe Club Hong Kong on 2010. It was about the last moment of Ngau Tau Kok Lower Estate (Hong Kong Public House). He started taking iPhone photographs three years ago and fell in love with using Hipstamatic for street photography. By using the new technology, he hopes through “The Underground Scene 2012” exhibition to highlight a new approach to photography. 2012, four featured photographers include Lai Yat Nam, set up “PHOTO NOW” Group. The principles of Photo Now is using documentary snapshots, exploring each corner of the city and recording each special moment. That moment of time is captured each time the shutter is pressed.